Tuv aimag. Region of Mongolia. Aimag. Aimak. Ulaanbaatar is an autonomous municipality; the aimag which surrounds it is called Tov, which means "central'. Just an hour's drive from Ulaanbaatar are restored monasteries in beautiful valleys, and mountains with some wonderful hiking. A large section of the aimag is part of the Gorkhi-Terelj, Khan Khentii and Bogdkhan Uul national parks. The ethnic groups include the Khaikh, the Kazakhs, and the Barga. Tov may not be the wildest or most spectacular aimag in Mongolia, but it's an excellent place to start your exploration, or to see some of the countryside if your time is limited. It has a network of good unpaved and paved roads, so you can easily use public transport to make day or overnight trips from the capital. The annual average precipitation is 12 inches (300 mm.) in the main part of the territory and 16 inches (400 mm.) in mountainous areas. The province is well-known of its springs, Janchivlan, Buuruljuut, Khundgan, Estii, Yestii, Suuj. Lakes include Dukhum, Davst, Gungaluutai, Tsaidam, Tsakhir. The soil in the South and West of the territory is pale, brown. Various trees such as Siberian cedar, larch, poplar, sallick, pine grow in the basin of Khentii mountains. Common are apple manus, wild cherry, black currant, wild rose fruits, rare liquorice, hippobopae, and medical herbs such as plaintain, bergenia, rooseroot, thorniopsis. In the province there are 16 species of endangered animals and birds, such as deer, does, elks, ibex, wild sheep, swans and snowcocks. The aimag is rich in species such as squirrels, marmots, foxes, bears and lynxes. Tourist attractions include historic places, such as Noyon Uul, Gua dov, Terelj durvulj, Tonyukuk's grave, poems of prince Tsogt carved in rock in Duut, as old as 450 years, impressive are the ruins of ancient cities of Hunnu, Uighur, Turkish Khanates in the province. There are many deposits of coal, iron ore, lead, tungsten, rocky crystal, spar, turquoise, azurite, mica, chalcedony, tin, gold and copper. Tuv aimag produces 22 percent of grain production, and 35 percent of vegetable production of Mongolia. Zoonmod. Nestled in a valley some 40km South of Ulaanbaatar, Zuunmod - the capital of Tov - is a laid-back town. If traveling independently, you may need to stay in Zuunmod to visit the nearby monastery, Manzshir Khiid, or hike in the nearby mountains. Otherwise there's little reason to linger. The chief attraction in Zuunmod is the Central Province Museum, opposite the south-east corner of the park - look for the sign in English. Like most aimag museums, it gives a good summary of the local geology, flora and fauna, and has a stuffed-animals section - the moose is gigantic. There are also some interesting black and white photos of Manzshir Khiid, including the once-regular tsam dances. The nearby Ethnography Museum is currently closed. Not in the same league as Manzshir Khiid but worth a brief visit, Dasnicnoinkhorlon Khiid is a 500m walk directly East of the department store and across the creek. If you ask the monks, you can go inside the temple. Ceremonies start at around 11 a.m. on most days. Manzhir monastery (Khiid) is about 1.5 hours from Ulaanbaatar in the lovely valley of Bogd Khan Mountains National Park. Built 1733 with 20 temples and 300 monks, it was destroyed in 1932. The last remaining temple was restored and contains now a small museum. Eej Khad - Near the village of Khoshigiin Ar in the sum (district) of Sergelen, 15km South of Zuunmod, is the sacred lock known as Eej Khad, or Mother Rock. XIII century national park creates real-time micro kingdom to make the lively feeling for its guests during their stay by genuinely providing true environment of the way of living and working of the XIII century. Bogdkhan Uul. The mountain Bogdkhan Uul (2122m) was proclaimed a national park as far back as 1778. During the Soviet period the park's status was formalised and it was renamed after Choibalsan. It is now designated the Bogdkhan Uul Strictly Protected Area (Bogdkhan National Park) (42,651 hectares). Unesco has also proposed to establish a wildlife park in the region, of up to 65,000 hectares. It seems that early legislation has ensured that the park won't become part of Ulaanbaatar's awful urban sprawl. The protected area is immediately South of the river, the Tuul Gol, South of Ulaanbaatar and west of Nalaikh. It surrounds Tsetseegun Uul and contains the Zaisan Memorial, Nukht and Manzshir Khiid. Four Holy Peaks. The 4 peaks surrounding Ulaanbaatar are considered holy. The Tsetseegum, Chingeltei, Songino Khairkhan and Bayansurkh mountains correspond, more or less, to the 4 points on the compass. These peaks are tremendous for hiking, and they're popular for their forests of larch trees, grasslands and stunning bird and animal life, including ibex and sable. The in-depth information about Four Holy Peaks see on pages dedicated Bogdkhan National Park. The Gorkhi-Terelj National Park – created 1993. It is one of the highlights of Mongolia. The spectacular valley with pitoresque high eroded rock formations, pine covered hills and steppe with edelweiss and dazzling variety of other wildflowers, sparkling waters of mountain rivers. 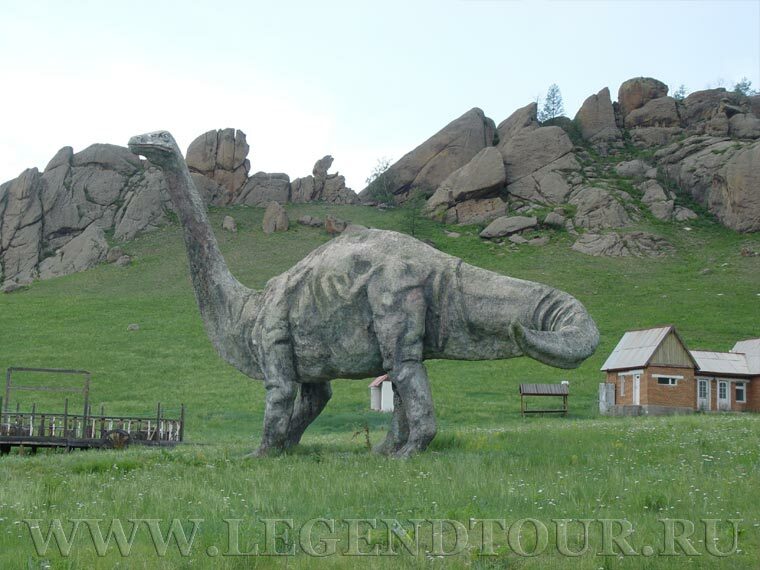 Most visited is the turtle rock and the dinosaurus park. Khandgait. About 40km North of Ulaanbaatar, Khandgait is another lovely area of cow pastures, small mountains, pine forests and wildflowers. surrounding the small village of the same name. Like Terelj, there are plenty of opportunities for hiking, rock climbing, fishing in the nearby Selbe Gol and, in winter, ice-skating and cross-country skiing (it's possible to rent skis and sledge here in winter). Khandgait is a cheaper and less touristy alternative to Terelj but, because of this, Khandgait suffers from a lack of transport and good facilities. Gachuurt. East of Ulaanbaatar, the village of Gachuurt is nothing special but the area near the village is delightful. If you're tired of the comparative hustle and bustle of UB and crave some serenity and clean air, Gachuurt is definitely the place for you. You can hire horses from nearby gers, catch fish, and go rafting in the Tuul Gol (check out Boojum Expeditions or Nomadic Journeys in Ulaanbaatar), hike in the nearby valleys, and camp anywhere you want. And all of this is only 21km from Ulaanbaatar. There is no hotel or restaurant in the village, so bring your own food and tent if you want to stay nearby. About 2km before the village there are plenty of serene spots to pitch your tent - just look for somewhere nice from the window of your bus or taxi. Khustay National Park. The nature reserve is about 100km (62mi) south-west of Ulaanbaatar. The Khustain Nuruu Nature Reserve was established in 1993 to preserve Mongolia's wild Takhi horses (Przewalski's horse) and the steppe environment in which they live. Nairamdal Zuslan. Only 30km from Ulaanbaator in the lovely Bayangol Valley, the Nairamdal Zuslan International Children's Center is an interesting alternative to Terelj. It may be full of hundreds of screaming kids from all over the world in summer, but you can easily avoid them and enjoy the serenity of the countryside. Nalaikh. The poor village of Nalaikh, 35km south-east of the capital, is part of the Ulaanbaatar autonomous municipality. Khagiin Khar Lake is a hidden lake in the middle of forest, which is unreachable by vehicle. The place is abundant with fishes/ lenok, taiman/, birds and wild life /wolf, bear, elk, deer, fox/. At 60 km from the lake we will meet local nomads km of area, and has pure water. The lake abounds in various and continues our trip on horseback through the dense forest. The map of Tuv aimag. Tour M109. 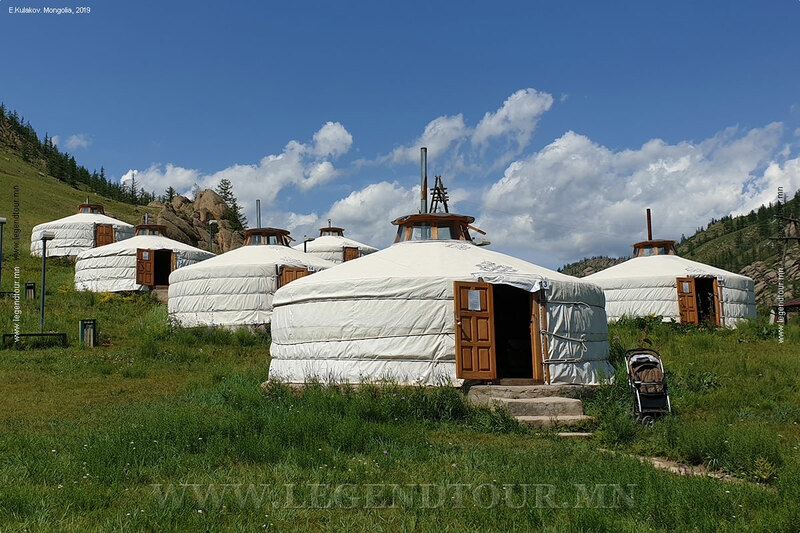 Around Ulaanbaatar (6 days/5 nights). 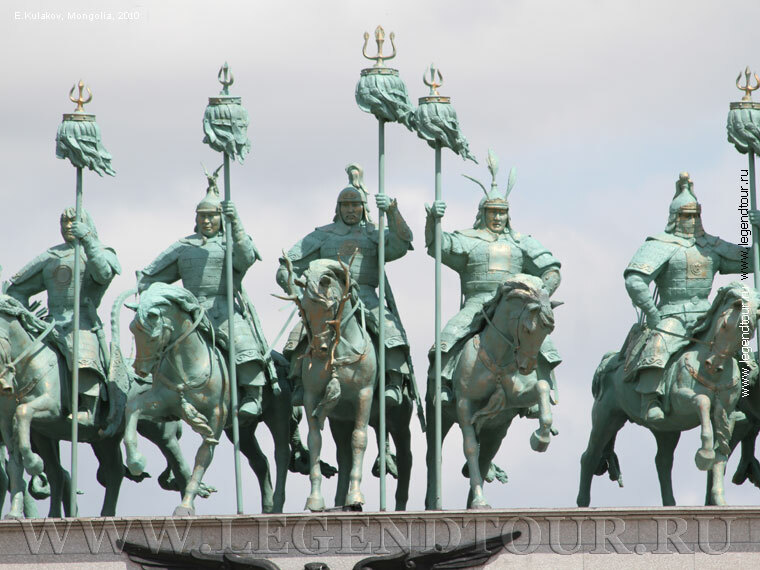 Your trip will start with excursion in Ulaanbaatar, capital of Mongolia. At this tour there are endless possibilities for hiking and trekking through gorgeous hills and amazing cliffs in Terelj area of Gorkhi Terelj National Park. At the residence of Chinggiz Khaan and field camp of Temujin Khaan you return to ancient times when Mongolian Khaans ruled the world. Facts about Mongolia 2000. by Da. Gandbold. ADMOND Co.Ltd., Mongolia.